This first-of-its-kind debit card offers customers the best deals, discounts, and rewards on online shopping. Times Internet, the digital arm of The Times of India group, and HDFC Bank Ltd, have launched an exclusive co-branded debit card ‘Times Points HDFC Bank Debit Card’. This first-of-its-kind debit card offers customers the best deals, discounts, and rewards on online shopping. This is the second co-branded card launched by Times Internet with HDFC Bank. The partnership began with the launch of a co-branded Credit Card targeted at the entertainment segment in 2013. Times Card is today a leading player in the entertainment category with over 3.5 lakh customers and its success led to the launch of the debit version. 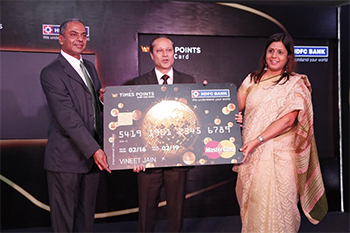 The Times Points Debit Card combines the synergies of HDFC Bank, the largest issuer of credit cards in the country offering a bouquet of cards catering to different segments of customers, and Times Points, an online loyalty product with over 18 million users. “After the success of Times Card, we thought it was imperative to continue to build value for our consumers. And thus came Times Points Debit card – the first card in the debit space that magnifies the value proposition to customers by offering the best online deals and rewards. The card is aimed for Young Adults in their first job who spend most of their time online and are extremely price conscious. We have had a great association with HDFC Bank by far, and this partnership aligns us on the collective vision of consistently delivering unique products and services to our customers,” said Archana Vohra, COO, Times Cards. Commenting on the new product collaboration, Parag Rao, Country Head - Card Payment Products and Merchant Acquiring Services, and Marketing, HDFC Bank, said, "At HDFC Bank, enhancing customer convenience lies at the heart of all our new initiatives. We are delighted to launch this new co-branded Times Points HDFC Bank Debit Card to cater to the evolving needs and lifestyles of our young and tech-savvy customers. This card gives great value in the form of discounts, offers, and rewards while shopping online. We are confident that our co-branded debit card will be a valuable addition to our growing portfolio of products that make shopping a truly rewarding experience." Times Points HDFC Bank Debit Card is positioned as a shopping plastic to help customers benefit from internet based deals and offers. Currently launching with 20 key welcome offers and over 350 running offers it will continue to add more deals every month. The card will have a daily Shopping limit of INR 2.75 lakh and an ATM withdrawal limit of INR 1 lakh.